Hotel lovers know that a property’s spa can be almost as important as its rooms. There’s just something special about knowing that after a day filled with sightseeing or business meetings, you can re-fuel with a massage or facial. Some hotels go above-and-beyond standard spa treatments and take pampering to a new level with one-of-a-kind offerings that highlight a destination’s unique character or landscape. Here are a few hotels with spas that we think offer treatments worth traveling for. This property, which was awarded “Luxury Sea View Hotel and Spa of the Year” by Luxury Travel Awards, manages to bring Cape Town’s iconic mountain into the action. 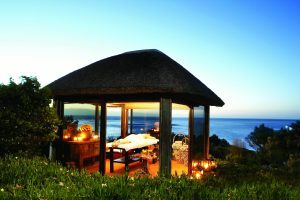 The Apostles touch treatment uses heated ocean shells and stones from nearby Table Mountain. It also includes essential oils featuring handpicked native fynbos (local flora). Best of all, guests (including couples) can opt to have their treatment at sunset in one of two outdoor gazebos that are set on the mountains overlooking the Atlantic Ocean. If the massage doesn’t relax you, the breathtaking view will. This award-winning, adult-only resort features a spa that’s cantilevered over the rainforest, so you can fully immerse yourself in the sights, sounds and scents of the incredible surroundings. The resort’s volcanic mud massage is said to be inspired by Costa Rica’s ancient beliefs that the use of the mud helps nourish and regenerate the skin and provides a sense of energy and inner peace. 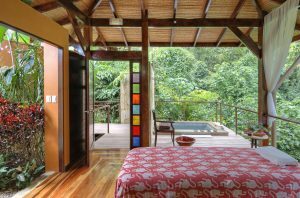 After the treatment, guests can lounge in a private plunge pool or, better yet, take a walk in the rainforest where you’ll likely run into a sloth who can no doubt show you a thing or two about relaxing! 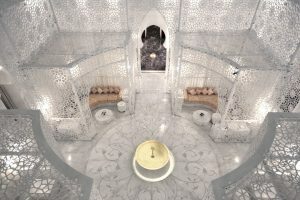 The spa at this World Luxury Spa award winner is worth visiting if only to bask in its beauty. The three-story sanctuary’s design incorporates Moucharabieh, a feature of traditional Arabic architecture that includes intricate carved wood latticework. The retreat also has an indoor pool with vaulted glass ceilings and an atmospheric hammam peppered with lanterns. Many of the treatments feature ingredients sourced from Morocco’s natural environment. Depending on your skin needs, you’ll enjoy a purifying clay collected from the Atlas Mountains or a regenerating body wrap with roses from the Kalaat Megouana valley. Our favorite is the gourmet glow wrap, which includes the use of local saffron—you’ll really look good enough to eat! It’s not every day you can experience a spa treatment in a UNESCO World Heritage site. Nestled on the lower slopes of the UNESCO World Heritage-listed Petit Piton, the aptly named Rainforest Spa is set in a series of treehouses rising above a serenading stream. This is another property that prides itself on making use of an abundance of natural riches; in a variety of treatments local bananas firm and smooth wrinkles, coconuts exfoliate, aloe vera rejuvenates and silky cocoa butter helps heal and hydrate. The three-hour long Sulphur Seduction takes you on a morning foray to the nearby volcanic Sulphur springs where you’ll bathe in the mysterious black waters and then enjoy a Sulphur mud bath and exfoliation treatment. 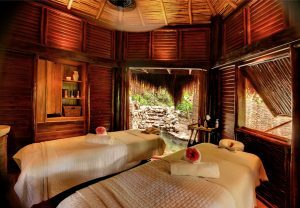 After rinsing off in the sun-warmed Piton waterfalls, you head back to the spa for a soothing massage. This spa is truly a wonderful place to get away from it all. Located in a remote fisherman’s village, all spa products are handmade based on the techniques of the Pataxo Indians and incorporate almescar, a tree sap found only in the Bahian region. The signature almescar facial starts with an exfoliating scrub using Bahian passionfruit from the surrounding rainforest and includes almescar tree sap, which is prized for its anti-inflammatory and cell-regeneration properties. 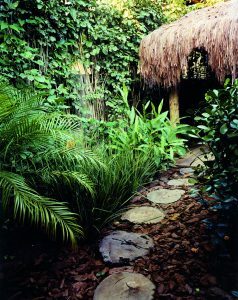 Other native ingredients used in treatments include virgin coconut oil, shea butter, Brazil nuts, fruits, pink pepper seeds, palm oil and cocoa grown in the hotel’s own gardens. 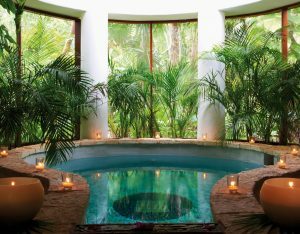 This resort’s spa blends innovative treatments with the restorative traditions of local Mayan ancestors. There’s a plethora of unique offerings, including the use of honey from its own Melipona beehive in numerous treatments. The friendly creatures are stingless and make honey that is said to contain amazing antimicrobial properties. The Temazcal Traditional Ceremony is an incredibly singular spa experience. This purification ceremony is reputed to harnesses the energy of the universe, the phases of the moon and the elements of air, fire, earth and water. Guided by a Mayan shaman, the ritual starts with a healing herb infusion poured over hot volcanic rocks to create an aromatic steam. The addition of ancestral drums and chants encourages meditation and self-reflection. For a peek at another unique spa treatment that’s out of this world, check out this therapy based on the lunar cycles at Capella Ubud Bali.